The history of Pappardelle in the Italian culinary tradition dates back to the 14th century and originated in Central Italy. Tuscany, Umbria and Emilia Romagna are the regions where the first testimonies of these strips of dough were found. 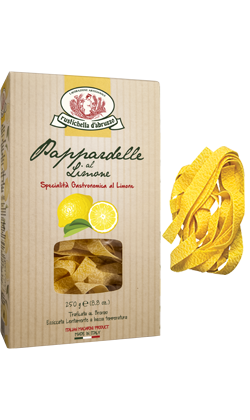 Rustichella d’Abruzzo proposes Pappardelle in the ‘lemon’ version, made with the use of true lemon juice, with no aromas added. Try it with boar meat ragù, mullet’s eggs and a bit of Extra Virgin Olive Oil; the sour taste of the lemon mixed with the delicate one of eggs will make your palate go through an intense gourmet experience. Rustichella d’Abruzzo proposes Pappardelle al Limone, made with top quality durum wheat semolina, fresh eggs and lemon juice added to the dough, bronze drawn and slowly dried at low temperature, in order to obtain an incomparable texture. The perfume of lemon mixed with the one of eggs will conquer you right after opening the packaging. We recommend it with a boar meat ragù, mullet’s eggs, truffle slivers and a bit of Rustichella d’Abruzzo PrimoGrano INTOSSO monocultivar Extra Virgin Olive Oil, or with our ‘Ragù bianco alla Salsiccia’ with fresh radicchio and a bit of Abruzzo Pecorino cheese. Cooking time: 4 minutes.